No Aaron did not catch this fish. 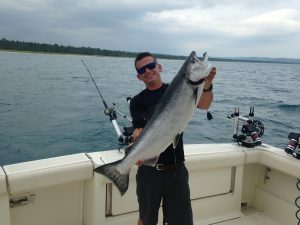 It is the first big salmon caught on a charter boat in Leland this season. Maybe more of these great fish will be coming to our waters. Lake trout continue to be the big catch. We are still getting limits of trout on most trips.